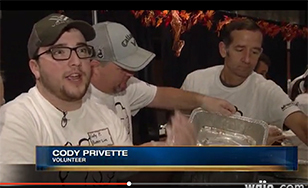 WDIO-TV Channel 10 covered the Twin Ports Thanksgiving Buffet. The 28th annual Thanksgiving Buffet sponsored by the College and the Twin Ports community was extensively covered by local media outlets. President Colette Geary was interviewed in two television stories as she volunteered unloading turkeys. KBJR-TV Channel 6 and KDLH-TV Channel 3 ran the story online, but did not include video. Several media outlets ran preview stories leading up to the buffet, including Hibbing radio station WTBX-FM and Twin Ports radio station KBMX-FM ("Mix" 108). FOX-TV Channel 21 did a story the day before. The Duluth News Tribune ran a preview focusing on the efforts of volunteers getting ready for the event, as well as a notice that the DTA bus service was offering free rides to the DECC. A number of media outlets covered the home-delivery of meals. The Duluth News Tribune focused on a Duluth couple. KBJR-TV Channel 6 covered a father and his children delivering together; the story also ran on CBS3 Duluth. Here's the day-of story by WDIO-TV Channel 10 and by CBS3 Duluth.